Big Bend is cool. You should all go there. Completely lost in it's own little world. 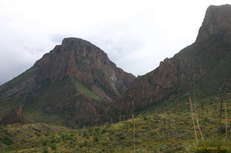 You drive off through backcountry texas, where SUVs have couches, gun racks, and cupholders mounted to the rooves, where the scrub just rolls off into the distance, and after a few hours you start to see mountains, and crazy exposed sediment. And then you're there. 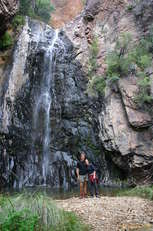 Free camping, unmarked attractions, walking tracks, 4wd tracks, a river, mountains, waterfalls, desert, it's got it all. 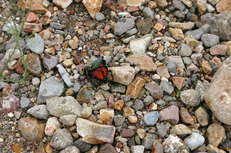 Road runners, tarantulas, mountain lions, they even have bears. Century plants, agave, and all the other desert flora. Dirt roads, washed out roads, mud, quirky rangers. Katie and I pulled in fairly late and set up camp in one of the free primitive sights. 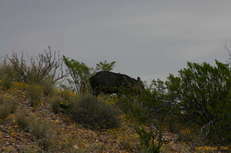 Woke up to find a javelina rummaging around about 50m away. sweet! First quirky desert animal spotted. Visited the rangers for some advice on what to do, and to pick up the map. 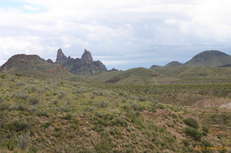 They were vague and seemed to encourage that visitors just spend a few days exploring big bend. I noticed a waterfall marked on the edge of a map, that's not listed on the tourist map, and asked about it. Hit a nerve! Seems it's one of their favourites, and they were a bit defensive about it at the time, as someone had just taken to the track with roundup in a misguided attempt at killing poison ivy. (They got rather a lot of bycatch) They gave us directions anyway, and we took off out to Cattail Falls. Which are wonderful, and well worth asking about when you get there. Quite an escape from the desert. 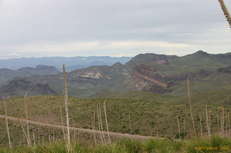 From there took the scenic drive down to the river, trying to get to Santa Elena Canyon. Passed the Mules Ears, and a whole array of exposed sediment cliffs. Layers layers everywhere. Didn't get to Santa Elena, which is meant to be fantastic, as I wasn't prepared to take the subaru through the flooded muddy roads. As we were turning around a jeep driver came through who we met later. He said it was a bit of an adventure in his car even. 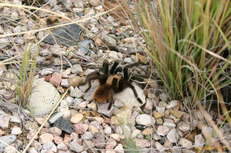 Saw about a half dozen tarantulas while driving out here. In the afternoon we went out to the grapevine hills, which was a set of rolling hills strewn with boulders and tors. 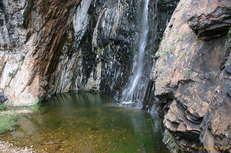 Pleasant walking, and scrambling. Easily a place where you could just wander out into the country for a few days and find some neat out of the way pretty spot. Saw a couple of road runners out here. Birds that run! And this was just the first day! Big Bend is out of the way for most of the US population, but if you're in the area, driving across I-10, it really isn't very far out of the way at all. Go there!